Take a look under the hood of quantum mechanics and see what it takes to build a particle and a field. Find out the real reason why there are two families of particles: boson and fermion. Learn where charge comes from and why the weak charge is so weak with parity problems. Take a look at the neutrino's structure and you begin to understand its properties. This peak under the hood started with Michael Faraday on the 29 of August 1831 who did the first experiment exploring the large scale quantum behavior of iron when a 6" diameter forged ring of iron was used as a transformer core to measure an induced electromagnetic impulse. Faraday's experiment and Faraday­-Maxwell equation for the description of induction is fine in free space, but when well annealed iron is used as a coupling agent the problem becomes one of the more interesting large scale quantum mechanical problems that exist. Like all good problems that persist for nearly two centuries it implied our view of physics is deficient. We know a great deal more about iron metallurgy than quantum mechanics, which has been studied for a much shorter time. 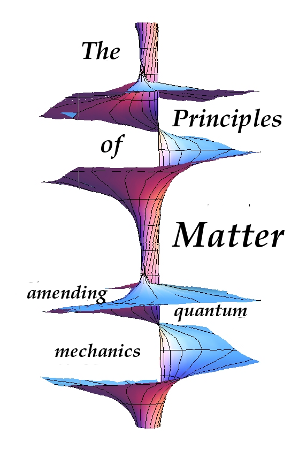 The problem we encountered in understanding originates with the foundation of quantum mechanics and the poor way in which relativity is integrated into quantum mechanics. 288 pages 59 illustrations sewn hardbound copies 6"x9"
Applying the self-reference frame in 2014 Youtube video 24 min.